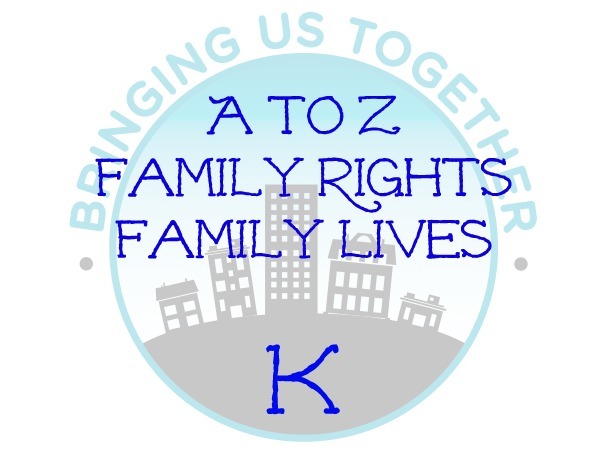 Today we continue with our A to Z of Family Rights and Lives. Thanks to the people in our Facebook group who continue to contribute their suggestions for these. K is for Keep: Keep fighting, keep going, keep talking, keep getting the word out, keep on keeping on. We are at it non-stop, with no breaks and there is no one to pick up the pieces if we aren’t there or don’t do it ourselves. We just go for it as we know that every minute, every appointment, every phone call, every meeting, every form to fill in is important and needs doing. Keys: you may have a safe place for the keys, a little key wrack neatly placed in a strategic place, a back pocket that you always put them in – and yet “I’ve lost the keys” is a well known saying in most households. Followed by “I know I just had them. Where did I put them? They must be somewhere!”. Our keys have known to be found in the rubbish bin, in the recycled bin, in the door of the car, in the ignition, in the washing machine, or in the dog’s basket. Like our keys, we lose control of many things in our lives and the chaos that ensues is yet another hurdle we need to face. Kicking Out and Kicking Off: We kick out; sometimes at the people who often don’t deserve it but happen to be nearby. We kick off because once again those who have never met us have made a decision that shows a total lack of understanding of our family and the circumstances we live in. Kicking off drains us but what other options are there? We need to find ways to stop situations happening where kicking off is seen as the only option. Changing the culture of services and the hearts and minds of people takes time but if we come together and unite as a force for change, nothing is impossible. Kids: They come in all shapes and sizes, they make us laugh and they can make us cry. They are our teachers and our little gems of inspiration. They can drive us to our wits end one minute and then we can feel as proud as punch the next. Life is definitely never dull with our kids and our journeys are much richer thanks to them. Kindness: If only we could put this into the national curriculum, if only we could get rid of Made In Chelsea on TV and have a programme called Made in Kindness. We could have Strictly Come Kindness or the Kindness Factor, or Britain’s Got Kindness. A kind act, however small, always brings happiness. If we can teach our kids to do one kind act a day then this is the greatest education of all. Kinship: The definition of kinship is “Connection by blood, marriage, or adoption; family relationship.” It can also mean “Relationship by nature or character; affinity – .a close connection marked by community of interests. Bringing Us Together is a kinship of families and practitioners connected by our interests. Kinship Carers: The latest figures show there are up to 300,000 children being raised by their grandparents, other family members or friends. because their natural parents are unable to do so. If you are looking after a child like this – full time or most of the time – then you are a kinship carer. The rights and responsibilities of kinship carers can be complicated. Getting advice is important so you know about your options and know if you are getting the practical and financial support that you are entitled to. Kiss: “Kisses are sweeter than candy”. We love our kids but somehow fitting in the nicest bits like kisses and cuddles on the sofa, or taking the time to go upstairs and give a goodnight kiss can be put on the backburner. Those are the precious times, worth taking time out for. Our children don’t stay little for very long and grow up too quickly. Kisses are something that many of us with children with complex needs don’t take for granted. Each one can give us a warm glow and we know that we are doing things right. Kitchen: The main focus point of many houses. It is where most of the important things happen. Where the washing up is done (or sometimes is not done which can drive us up the wall); pots are kept in the broken cupboard that used to swivel ; knives and forks in the drawer that could do with a bit of a clean; where meals are cooked in the oven that you used to be able to put on automatic clean but now is a major operation to scrub; the hob that try as you may never ever looks like it did when you first bought it; and the pull out drawers that get jammed. Where the floor is sticky (unless you have one of those steam cleaners); where the dogs can get into the bins; where the kids leave their homework and where the paperwork just piles high. Oh, and the fridge no longer produces ice or cold water. Knowledge: We learn something new every day about our world of disability. We search the internet, go our courses, talk to people, read books, download documents, join support groups, phone help lines, ask questions on facebook. We want to try and understand and the more we know, the more we can help ourselves, our kids and our families and friends. We will be soon looking at the letter L, what does that mean to you? Love? Loathe? Lunacy? Lonesome? Let us know. Don’t forget to sign up for our posts, so you don’t miss a thing.